The wild horse is a species of horse known by the scientific name Equus ferus . It is represented by only one surviving species known as the Przewalski’s horse (E. f. przewalskii). Its home was taken from them years ago by farm livestock eating all of the local food and taking to much water, leaving little to none left for the Przewalki. these horses are extremely resilient and thus have never been tamed, that is why they are the only wild horses left on earth. they are currently being rehabilitated in Mongolia in hopes of reviving the once very large population. These horses are also known to be very affectionate to their herd members. The stallions are very territorial and strong and will defend their herds against other males. These are very beautiful animals that God has placed on this earth for us to admire. It would be a very horrible thing if these animals were to fall of this earth, God in fact has placed it upon us to protect his creation. Every Creature, Everything, is Part of God's Creation. The wild horses or Equus ferus, have short tan fur, a dark brown long tail and a mane. The mane does nt fall down like most horses it stands erect on the neck of the horse. The Przewalski's horse is much shorter and stalkier than most domestic horses. it has very short legs, a large head and a bulging forehead. In the spring time they shed the thick coat so that they do not retain heat as much and do not over heat.They have a heavy winter coat grows in during the winter to protect them from the cold enviorment. Their teeth are divided into two major sections. The incisors, which are the teeth located in the front of the horse's mouth, and the cheek teeth, made up of the premolars and molars.The horse chews in a circular motion with the bottom jaw grinding along the top teeth. This circular motion maintains the occlusive surfaces of the teeth. This motion is reduced as the horse eats. Horses have legs that are made for running, they have long legs and a single toe covered in a hard hoof. the single hoof helps to dig into the ground so the horse may get a good grip while running. They stand about 12 to 14 hands tall at the shoulder, or about 48 to 56 inches (122 to 142 centimeters), and weigh about 440 to 750 pounds (200 to 340 kilograms). Their are 3 cycles to a horses life; new born, yearling, and adult. All horses breed sexually and give birth to live young. the new born are called foals, they are born and are able to stand in about 1-2 hours, The mother feeds the foal her warm milk for a year. Foals also eat grass and hay after a few weeks. When a horse is one year old it is then a yearling, males are colts and females are fillies. they are usually about the same size as their parents by this time. At the next stage the horse is officially an adult, males are stallions which take the lead of the herd and females are named mares. Mares usually only mate in the spring and summer months and carry their baby for 11-12 months before giving birth. The Asian wild horse used to roam the on the steppe, shrub lands, and plains of western Mongolia and northern China. but due to farming and other domestic herds they now are only found in captivity in reserves. While their greatest threats today include a loss of genetic diversity, their extinction in the wild was also brought on by hunting, loss of habitat, and loss of water sources to domestic animals. Przewalski's horses live in harems that consist of a dominant stallion and several mares. Young stallions form bachelor bands, which is where they remain until they are able to form harems. Males are territorial and compete with other males to acquire females for their harem. 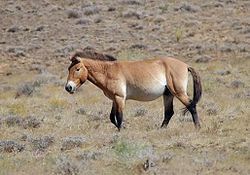 Przewalski's Horse is legally protected in Mongolia. It is protected as Very Rare under part 7.1 of the Law of the Mongolian Animal Kingdom. Hunting has been prohibited since 1930, and the species is listed as Very Rare under the 1995 Mongolian Hunting Law. 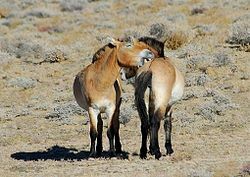 It is listed as Critically Endangered in both the 1987 and 1997 Mongolian Red Books, and in the Regional Red List for Mongolia.An International Studbook was produced in 1959, which developed into the Species Survival Plan for the Przewalski’s horse. Many countries now help these programs to stop inbreeding and retain genetic diversity in their horse populations. Their are currently 3 reintroduction sites in Mongolia. all 3 sites are monitoring their populations and are integrating community livelihood support into their projects. the health of these animals should be monitored for diseases for a higher chance of survival. a single population plan should be kept for every population to secure stability.The genealogy of all horses in Mongolia should be established based in individual micro-satellites to monitor inbreeding levels, identify hybrids, and plan for necessary movements of horses between reintroduction centers to maximize genetic diversity. more communication between rehabilitation centers would be very helpful. ↑ . Przewalski's horse The Free dictionary. Web. February 28, 2013 access. ↑ . domestic horse creation_wiki. Web. February 28 2013 (access). ↑ Himenes, Manuel. Understanding your horses teeth American Association of Equine Practitioners. Web. June 16th, 2002 (published). ↑ 4.0 4.1 Przewalski's Horse National Geographic. Web. Accessed February 28, 2013. ↑ Horse lifecycle http://willowridge.shs.k12.ny.us. Last Modified: Mar 08, 2009. ↑ Boyd, L. Equus ferus http://www.iucnredlist.org 20 March 2013 (publication). This page was last modified on 20 January 2016, at 15:03.